Allow us to take you straight to the top. We promise you, by the end of this journey you’ll be ready to soar. There are three breath-taking BluSky Penthouse suites currently available at Liberty Central By The Lake Two and they each offer sweeping views of Lake Ontario and Downtown Toronto as well as exceptional design details. With the added luxury of a personal rooftop terrace, and an ideal location in the heart of Toronto’s most sought after neighbourhood, you can stop dreaming about your perfect forever home. It’s here. Let us begin our journey with the two-bedroom, intelligently designed Cyngus suite. The 865 square foot Cyngus suite offers a life of comfort and lush living for both couples and those living on their own. When you arrive, you will step into an expansive foyer that leads into an open living and dining area. The stunning living and dining room give way to a chic kitchen with modern appliances and a working breakfast bar that is perfect for eating in and for entertaining. The suite’s lower level 145 square foot balcony provides a perfect extension of the living, dining and kitchen areas and, with its BBQ connections, offer a great place to cook and enjoy a meal. The spacious master bedroom with its ensuite bathroom and oversized walk-in closet are to the left of the living and dining area and the second, equally stunning bedroom is on the opposite side, close to the foyer. There is also a second bathroom, storage space and a separate room for your washer and dryer on this level. 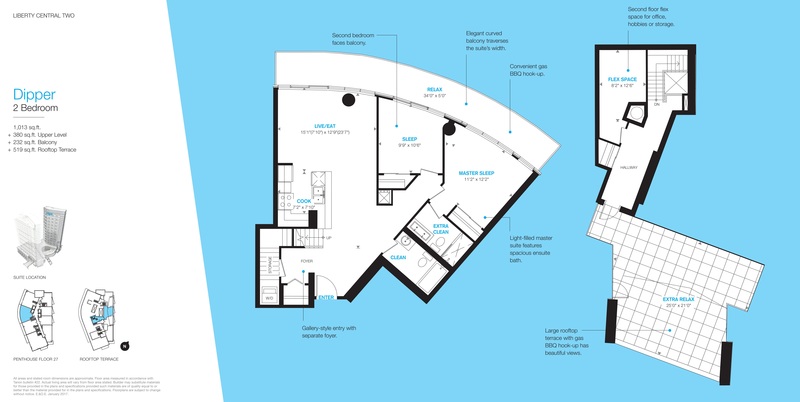 With the 167 square foot upper level you will get additional space for storage and a sweeping 373 square foot terrace. Bask in the incredible sunsets across the lake, indulge in a good book, entertain friends and family or simply enjoy the cool summer mornings and breezy fall evenings on this perfect rooftop terrace in your forever home. The Dipper suite is 1,013 square feet of modern luxury. This suite, also ideal for couples and individuals, offers the ultimate in convenient living and a lot of space to enjoy. Once you step through the door, you will be enchanted with the gallery-style entry, complete with a separate foyer to the left. Follow the stunning path to the living and dining room area that joins the contemporary kitchen, a perfect space to prepare and enjoy gourmet meals and to entertain. To the right of the living and dining areas are the light-filled second and master bedrooms. The master bedroom boasts a beautiful ensuite bathroom and lots of room to accommodate your king size bed and more. You may never want to leave. The living room, dining room and bedrooms are connected by an elegant 232 square foot curved balcony. We know just what you’re thinking: wow! It really is stunning. The main floor also includes separate storage spaces, a laundry space for your washing machine and dryer and a second bathroom. On the 380 square foot upper level, you will find additional space for a home office, storage or a reading nook. The (Blu)sky is the limit! The Dipper’s rooftop terrace is 519 square feet of unforgettable views and, like the main floor balcony, is equipped with a gas BBQ hook-up. This suite is another incredibe Liberty Central unit that is the perfect place to call home. Welcome your family to their new home in Liberty Village. Right outside there are restaurants, shops and a world of conveniences. Inside, this 3-bedroom, 3 bathroom 1459 square foot suite is pure perfection. The suite opens into the foyer, with a bathroom located just ahead to the left and a large storage area to the right. A more few steps will bring you to the extensive living room and dining room areas that provide ample space for you, your family (and friends) to relax, watch TV or enjoy a wonderful meal. Your modern, fully-equipped kitchen with stylish working breakfast bar opens to the formal dining space, providing easy access to the living and dining areas. Enjoy at-home dining and the convenience of seamless back and forth movement between both spaces. With this floor plan, you won’t miss a moment of family time or time with your guests while you’re entertaining or having a meal. There are two stunning bedrooms located to the left of the living and dining areas, and both bedrooms, as well as the living room space have access to the beautiful 259 square foot lower level balcony (that comes complete with a BBQ gas hook-up). On the other side of the expansive living room space, you will find the magnificent master suite, with its own 184 square foot private balcony, a huge ensuite and a large walk-in closet. There are two other bathrooms on the main level, one of which is also ensuite, as well as a separate room for the washer and dryer. The 241 square foot upper level opens into a hallway that leads into a space that can easily be transformed into a home office, provide additional storage or it can be used for tons of other purposes. Your oasis awaits in the 601 square foot rooftop terrace. Decorate with lounge chairs, umbrellas and trellises and laze away under the beautiful Toronto skyline while you enjoy a glass of wine or catch up with friends. You may never need to take another vacation. Paradise is right here. 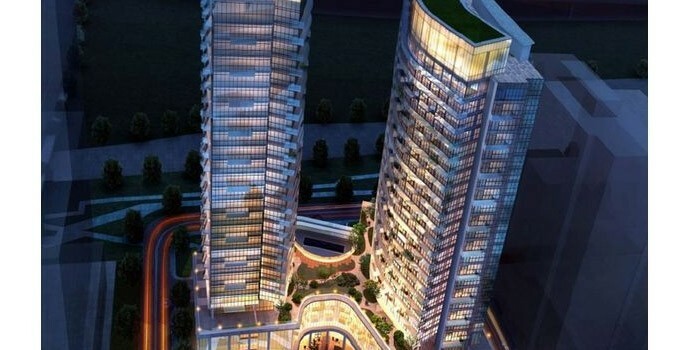 The BluSky suites at Liberty Central By The Lake Two are priced from $738,900 to $1,161,900. Take comfort and luxury to new heights with one of these incredible suites. To find out more, register on our Live in Liberty website or for information about other Liberty Central By The Lake Two units, connect with us on our Liberty Central app for android and iPhone users, visit us on Twitter at @liveinlibertyTO and like us on Facebook.